Prostate cancer is the second leading cause of cancer death in the United States. With few exceptions, the 30,000 prostate cancer deaths that occur annually in the United States are due to failure of androgen deprivation therapy. Androgen deprivation therapy targets the genomic action of the androgen receptor. Our laboratory’s research program focuses on generating insights into the specific molecular mechanisms by which the androgen receptor drives prostate cancer progression. The long term goal of our group is 1. to develop novel prostate cancer-selective forms of androgen deprivation therapy and 2. to optimize and personalize the administration of available forms of androgen deprivation therapy. We pursue these goals through 2 lines of research that study coregulator-dependent direct mechanisms of androgen action and an SRF-dependent indirect mechanism of androgen action. Central to our research efforts are integrated approaches that combine an understanding of the basic mechanism of androgen-dependent gene transcription, systems biology approaches designed to answer specific questions, and clinical relevance of our research findings. This work is done via multidisciplinary collaborations with physicians and scientists from the Departments of Cancer Biology, Urology, Hematology/Medical Oncology and Pathology, and involves a growing number of national and international collaborations. Androgen deprivation therapy is used to treat advanced prostate cancer and leads to cancer remission; however, it is not curative and has severe side effects. Moreover, tumors can become treatment-resistant and progress to a lethal stage. 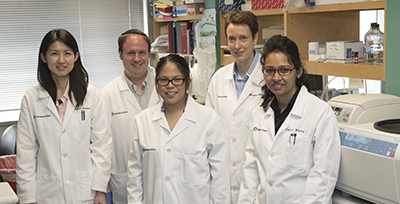 Using insights to the mechanisms that the androgen receptor uses to drive prostate tumors to become lethal, the Heemers laboratory seeks to identify new drug targets for novel, more prostate cancer-selective forms of androgen deprivation therapy. S. Liu, S. Kumari, Q. Hu, D. Senapati, V.B. Venkadakrishnan, S. Wang, A.D. DePriest, S.E. Schlanger, S. Ben-Salem, M.M. Valenzuela, B. Willard, S. Mudambi, W.M. Swetzig, G.M. Das, M. Shourideh, S. Koochekpour, S.M. Falzarano, C. Magi-Galluzzi, N. Yadav, X. Chen, C. Lao, J. Wang, J.Billaud, H.V. Heemers. A comprehensive analysis of coregulator recruitment, androgen receptor function and gene expression in prostate cancer. eLife. 2017;6:e28482. S. Kumari, D. Senapati, H.V. Heemers. Rationale for the development of alternative forms of androgen deprivation therapy. Endocr Relat Cancer 2017; Aug; 24(8):R275-R295. PMID: 28566530. Heemers HV. Editorial: Androgen receptor and prostate cancer: new insights in an old target translate into novel therapeutic strategies. Curr Drug Targets 2013;14(4):399-400. PMID: 23565752. Heemers HV. Identification of a RhoA- and SRF-dependent mechanism of androgen action that is associated with prostate cancer progression. Curr Drug Targets 2013;14(4):481-9. PMID: 23469924. Verone AR, Duncan K, Godoy A, Yadav N, Bakin A, Koochekpour S, Jin J-P, Heemers HV. Androgen-responsive serum response factor (SRF) target genes regulate prostate cancer cell migration. Carcinogenesis 2013 Aug;34(8):1737-46. PMID: 23576568. Poch MA, Mehedint D, Green DJ, Payne-Ondracek R, Fontham ETH, Bensen JT, Attwood K, Wilding GE, Guru KA, Underwood W, Mohler JL, Heemers HV. The association between calcium channel blocker use and prostate cancer outcome. Prostate 2013 Jun;73(8):865-72. PMID: 23280547. Schmidt LJ, Duncan K, Yadav N, Regan KM, Verone AR, Lohse CM, Pop EA, Attwood K, Wilding G, Mohler JL, Sebo TJ, Tindall DJ, Heemers HV. RhoA as a mediator of clinically relevant androgen action in prostate cancer cells. Mol Endocrinol 2012;26(5):716-735. PMID: 22456196. Yadav N, Heemers HV. Androgen action in the prostate gland. Minerva Urol Nefrol 2012;64(1):35-49. PMID: 22402316. Heemers HV, Schmidt LJ, Sun Z, Regan KM, Anderson SK, Duncan K, Wang D, Liu S, Ballman KV, Tindall DJ. Identification of a clinically relevant androgen-dependent gene signature in prostate cancer. Cancer Res 2011;71(5):1978-88. PMID: 21324924. Research from the laboratory of Hannelore Heemers, PhD, Department of Cancer Biology in the Lerner Research Institute, uncovered a previously unknown driver of prostate cancer which may be a viable target for treatment. The findings were published in the high-impact journal e-Life. While most prostate cancers are slow growing and not fatal, some are aggressive and lethal. Genomic fingerprinting has helped physicians to predict the aggressiveness of an individual’s cancer based on the tumor’s genetic makeup and to tailor their treatment plans accordingly. However, in the majority of cases, multiple tumors are present in the prostate, but typically only the largest (“index”) tumor is fingerprinted.